Following the cessation of the Third Ypres or Passchendaele offensive the British Army in Flanders went into its winter positions and the 22nd Battalion, relieved from their Ypres front line positions, proceeded with the I Anzac Corps to the quiet front at Messines. As the Battalion marched along the Vlamertinghe-Reninghelst Road on the 12th November 1917, General Birdwood inspected the Brigade. However the men’s boots did not withstand the march very well as they had become sodden while in the support area during the past few days. The Ypres fighting from September to November 1917 had hit the Australian divisions heavily, and for the 22nd Battalion their strength was now down to 23 Officers and 517 other ranks, approaching half of the number that entered the offensive two months previously. Upon arrival at camp the men spent the first days cleaning up and improving the facilities. Reinforcements began arriving from 2nd ADBD bringing the Battalion up to 30 Officers and 640 other ranks. 110 had returned from hospital, 10 from camp and 32 from the recently arrived 19th Reinforcements. A number of the men were Taken on Strength back into the Battalion having been re-assigned while in England to battalions within the AIF 6th Division which was subsequently disbanded in order to reinforce the five veteran divisions following the heavy losses at Ypres. Training – assault training, gas drill, musketry (rapid loading and firing), close order drill – and sports and recreational activities soon became the order of the day. The Battalion crossed the border from Whippenhoek and into a part of Belgium that was new to it, Mount Kemmel (photograph above) from whose summit a magnificent view of the Ypres battlefield could be obtained. The Mount itself had protected the little hamlet of Locre from the ravages of war, and while at the Kemmel Huts the battalion enjoyed its happiest times during the war. The winter of 1917-18 was not nearly so trying as that of the previous year on the Somme, as the weather was milder, the demands on the men far less exacting, and the camps and bathing facilities were close to the line. The huts were the best since the battalion arrived in France and Belgium, comfortable and warm with plentiful supply of coal pilfered from neighbouring dumps. 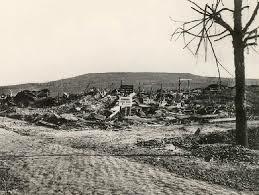 On one night however the camp was visited by a German aeroplane that dropped six bombs damaging some of the huts but not causing any injuries. In the relative comfort behind the lines the Battalion took the opportunity to hold Christmas lunches. On the 7th December ‘A’ Company was the first Company to hold its Christmas lunch in the Recreational Hall. Elaborate menu cards were provided for the well provided meals, ably enhanced by the efforts of ‘salvagers’ in each Company as well as a generous donation of £100 from Mrs Craig, wife of Major Craig, DSO, the Battalion’s popular medic. ‘C’ Company was the last to enjoy their festive meal on 11th December. At the dinners a silent toast was drunk in memory of the fallen comrades. On the 15th December 1917 the Battalion left camp at noon and route marched for Camp No.2 at Kortepyp close to Ploegsteert, consisting of huts that were in a fair state of repair. Upon arrival the 22nd Battalion relieved the 42nd Battalion and became part of the 6th Brigade in Reserve to the 5th & 7th Brigades in the front line from the River Douve to a point near Armentieres. The 6th Brigade was ordered to be prepared to move forward at short notice in case a counter-attack was launched. Here the Battalion remained for a month, training or working on reserve lines in the morning, with sports in the afternoon. While the Battalion was at Kemmel, Captains Bunning and Alderson left to join the Indian Army, with Captain Cawthorn leaving a month later, all carrying with them the good wishes of the men. On the 25th December bonus Christmas dinners were held and the festivities extended well into the night, particularly in ‘C’ Company where Pte Monar and party entertained their friends at a rum supper. The following day and in accordance with Field Marshal Haig’s instruction to build a three tiered defensive position ahead of the expected German offensive in the Spring, work began on the second or Corps Defence Line, with 90 men loading and unloading stores at Romarin siding. For the men of the 22nd Battalion and 6th Brigade this meant utilising the strong natural features afforded at Hill 63 and the natural obstacle of Ploegsteert Wood (photograph above showing a fatigue party from the 22nd Battalion bringing up barbed wire in Ploegsteert). Here the men worked on building the wire entanglements in the frosty conditions and frozen ground (see photograph two above showing men from the 22nd Battalion working on the entanglements on 26th December 1917). On the 12th January 1918 the Battalion moved to Romarin and then to a system of dug-outs called the Catacombs just behind Ploegsteert Wood. These catacombs were an underground dug-out city, large enough to comfortably house a couple of thousand men, consisting of great timbered drives and tunnels into the side of Hill 63. In galleries driven at right-angles off the main passages, long rows of wooden bunks were erected. The place was electrically lighted and though the atmosphere was a little stuffy, troops fresh from the line were very appreciative of the solid comfort of a good dry bed (photograph above showing men from the 6th Brigade in the Catacombs). 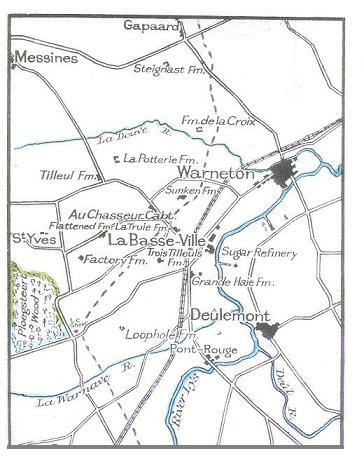 On the 18th January 1918 the Battalion moved into the front line at La Basse Ville facing the town of Warneton (see map below), in an area with a very bad reputation owing to the number and size of the Minenwerfers or ‘minnies’ employed by the Germans. It rained heavily and continuously during the tour of front line duty, flooding the posts and communication trenches, creating conditions the like of which the Battalion had not known since Flers and Ginchy the previous winter. Patrols were very active and successful, frequently bringing in prisoners. CSM Carter while in charge of a reconnoitring patrol accounted for several Germans, one of which was carrying some very useful maps, an action for which he was awarded the Distinguished Conduct Medal. After resting for a week following their relief, the Battalion moved to Shankill huts near Neuve Eglise then entrained for the village of Selles, about 20km from Boulogne. For the Battalion this was the furthest that they had been from the front line since their arrival in France two years earlier, offering ample opportunity for leave to Boulogne, and here they remained until 6th March. Sports took place during their time at Selles. A Divisional Platoon competition for shooting and bayonet fighting was won by X Platoon of ‘C’ Company under Lieut. Gorman, where the excellent Lewis Gun work by L-Cpl Binns, MM & Bar, significantly helped in their winning. On the 6th March 1918 the Battalion began its return to the Catacombs where it took up position in the Brigade Reserve near Ploegsteert. On the 9th March four men were killed in action – the worst day for the Battalion since the 9th October Broodseinde attack – including 2nd Lieut. Robbins of the 5th/22nd having only just returned with his commission from the Officers Cadet Battalion in England. A four day tour of front line duty commenced on the 11th March before being relieved by the 21st Battalion who two nights later were raided by the Germans after a heavy Minenwerfer barrage. The Battalion spent the next eight days in reserve before returning to the La Basse Ville front on the 23rd March, two days after the start of the great German Spring Offensive that was taking place in the St. Quentin area on the Somme. As a result the gigantic ‘minnies’ were even more active than previous causing a number of casualties, including 2nd Lieut. Parsons, MM, who died of his wounds. His chief consideration, being carried from the line, was that the stretcher-bearers should not unduly distress themselves on his account. Overall during this relatively quiet winter period thirteen men from the 22nd Battalion lost their lives. During the night of 25th/26th March Pte McKenzie and Cpl Binns, the latter with his Lewis Gun, were awarded the Military Medal for conspicuous gallantry when their fighting patrol encountered the enemy in force and through their action enabled a satisfactory withdrawal. By the end of March word had reached the Battalion that a tremendous German offensive had been launched on the Somme and that within a few days all the old Pozieres and Bullecourt battlefields that had been won at such a heavy cost were now in German hands. A move south was expected and on the 31st March a British Regiment that had been fighting on the Somme arrived to effect the relief. On the 2nd April 1918 motor buses were boarded at Neuve Eglise and the Battalion moved to Berthen, about nine kilometres from Bailleul. From the big hill outside Berthen a last view was obtained of Ypres and the Flanders battlefields. Two days later the 22nd Battalion reached the village of Godwaersvelde, where a train was waiting to convey the Battalion to the Somme once more.